SignWay, Inc. designs, manufactures and installs the absolute highest quality professional signs and visual marketing displays available. This is accomplished through the utilization of the most modern methods, materials and technology in conjunction with the employment of the industries top fabricators and installers. 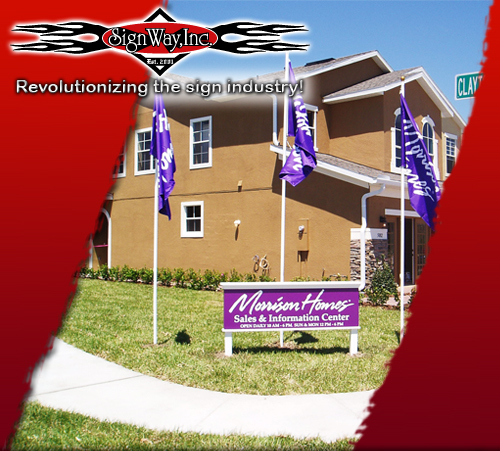 We are revolutionizing the sign industry with our products, service and design. We specialize in assisting corporate accounts that are looking for statewide uniformity in regards to their signage at all their communities/properties. We also fabricate and install interior and exterior model center packages for homebuilders, entry wall signage for developers and home owners associations as well as commercial and residential real estate signs of all types and sizes. We proudly serve the top homebuilders, commercial/residential real estate companies, developers, home owners associations and property management companies throughout the state and are thankful for their unwavering trust and dedication to our company for all of their signage needs. Last but certainly not least, we provide wholesale CNC routing, digital printing and other custom signage services to sign companies that would like the ability to offer a vast variety of products without the overhead required to make them in house. the opportunity to earn your business.